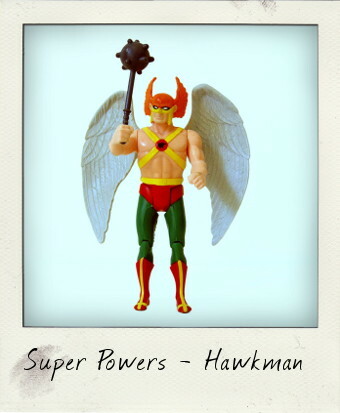 Any regular readers of this blog will know that my big collector's crush of the moment is on the vintage Kenner action figures known as Super Powers. Produced for a mere two years from 1984 until 1986 when the line folded after only three series, these 4-inch action figures starring DC Comics superheroes with built-in power action features, are still hugely sought after by many toy fans. Let this post serve as a warning – buy just one of these figures and you'll soon find yourself wanting each and every one of them! 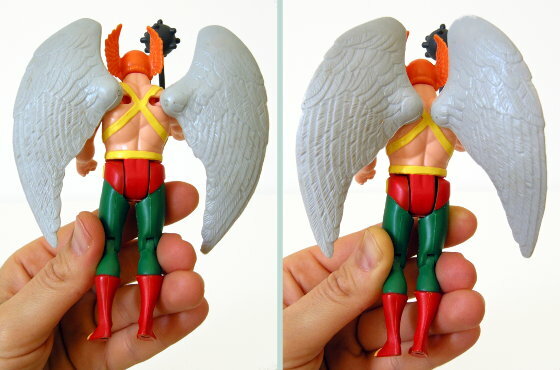 Kenner created Hawkman to scale and he is larger than most of the other figures in the line, measuring 4 ¾ inches from his toes to the tip of his helmet wings and towering over the other figures (which would come in handy later when he was recycled as Little John in the Robin Hood series). He was also issued with a great mace accessory that my loose figure still has. The most exciting feature, however, was without doubt his Power Action Flight Wings - when his legs are squeezed together the wings actually flap. To Kenner's enormous credit, this solidly constructed figure's heavy wings still work after 27 years! An awesome find - I love this figure!